Hi everyone! This is my first Free Game Analysis post on chesssummit.com, and I’m really excited to get this section of my blog underway. For those of you who don’t know, if you would like to have your games analyzed by me for free, send your PGNs to chess.summit@gmail.com, and if you are lucky, I will post them on my blog! For today’s post, I was sent two games from an up-and-coming amateur from the Northern Virginia area, Maciek Kowalski, who recently competed in the Washington Chess Congress. In just the last year, his rating has increased by roughly 275 points, getting him to his current best, 1472! That being said, let’s take a look at two of his games. I consider 1 Nf3 one of the most flexible starting moves for White, and probably the best option for a positional player who is looking to cut down on learning theory. This move 6 Qc2 is seemingly out of place. 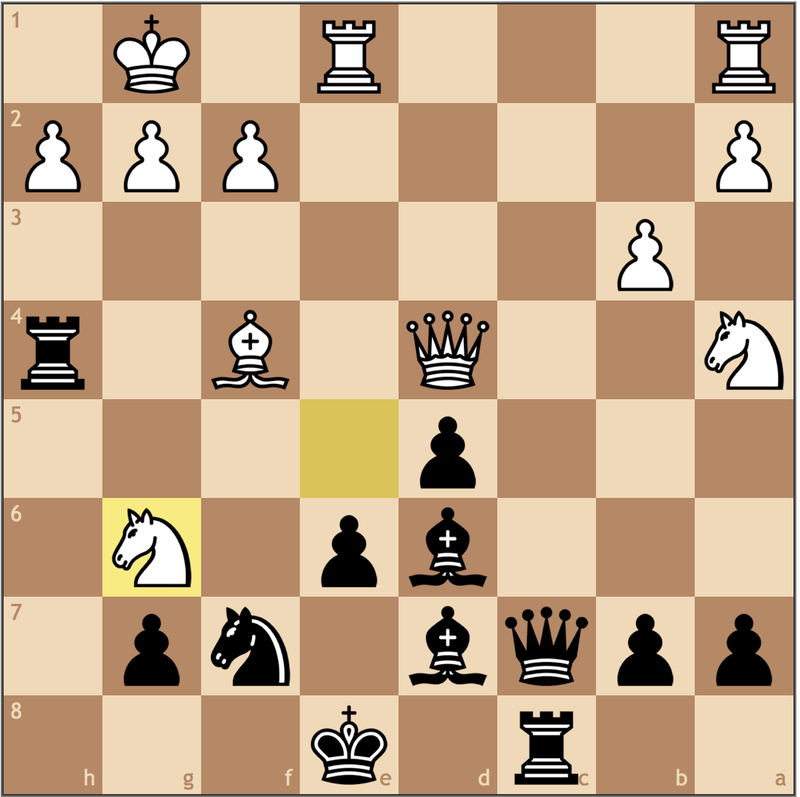 Though a thematic idea in the Catalan, here Black hasn’t committed to a Queen’s Gambit Declined structure. Usually, the goal of Qc2 is to push e2-e4 to break a static pawn structure in the center, but here Black’s pawn is on d6 and not d5. I have a couple suggestions for White here that may prove a little more testing for Black. 6 Nc3 is the most natural, and I’ve had this position a few times myself, the idea behind this move is to move the d-pawn to d3 and should Black choose 6… e5, the game starts to feel like a reversed closed Sicilian. If White is hoping for something a little more assertive, 6 d4 is the easiest way to play, reaching a King’s Indian Fianchetto variation. While there is a lot of theory behind this line, the more tame variations are mostly intuitive and promise White a good game. 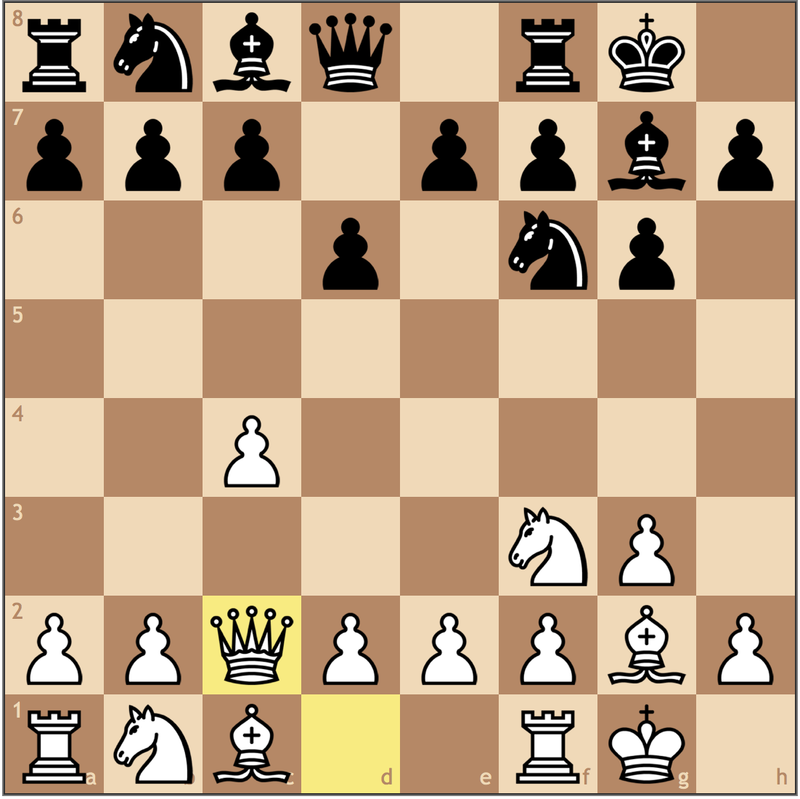 With either structure, its not immediately clear where to put the queen, so by not playing Qc2, White saves a tempo. I hope this position illustrates my concern with 6. Qc2. While White has achieved solidarity, it was at the cost of a tempo, as the queen no longer has an active role in the fight. While this double fianchetto structure seems passive, it could have been attained with 6. d4 followed by b3, where the d-pawn blocks the long diagonal from any tactics. This would also justify a later Qc2 and White has a game. In the mean time, Black has constructed a rather crafty set-up with a bishop on c6. While not orthodox, I think its justified given White’s wasted tempo. 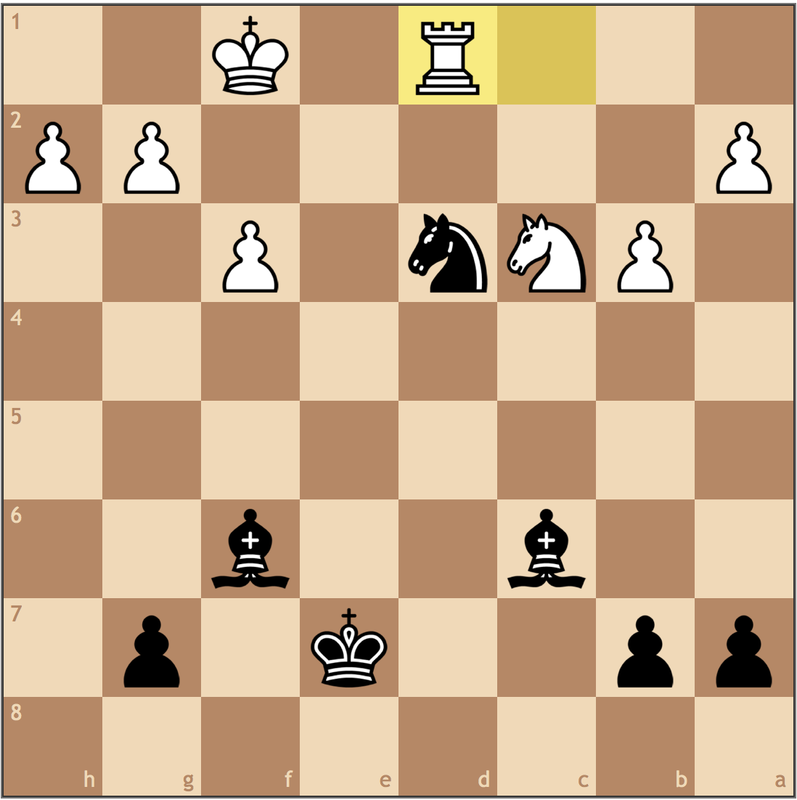 I thought that Black had put up reasonable resistance up to here, but now White begins to play for a sharp edge. 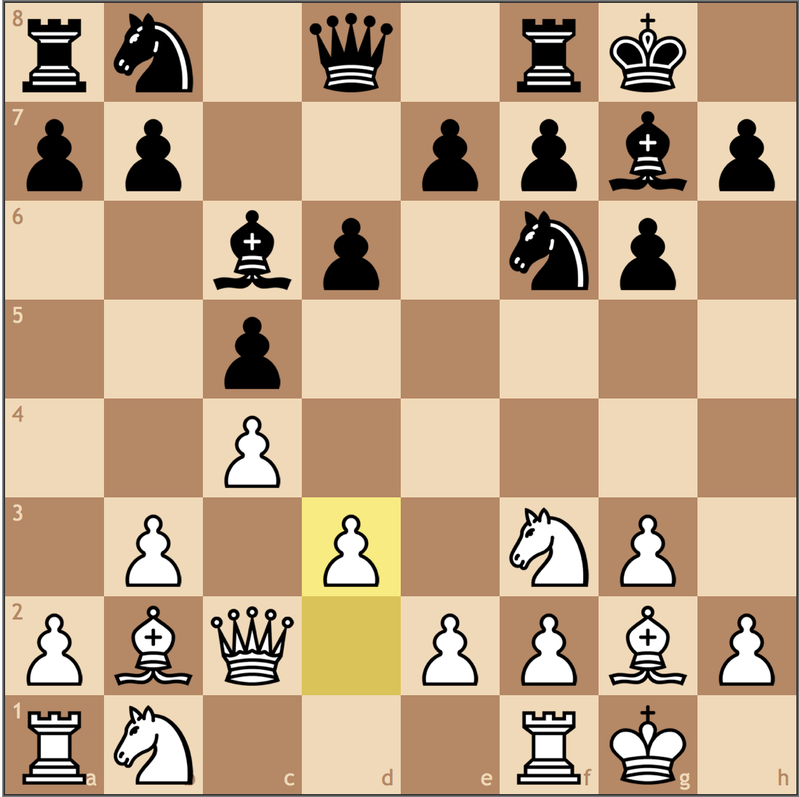 This b7-b5 move allows for White to play d3-d4, the thrust that justifies Maciek’s set-up. Here Black really needed to ask himself what White’s plan was, and with moves like Re1 and e2-e3, the goal d3-d4, is not transparent. 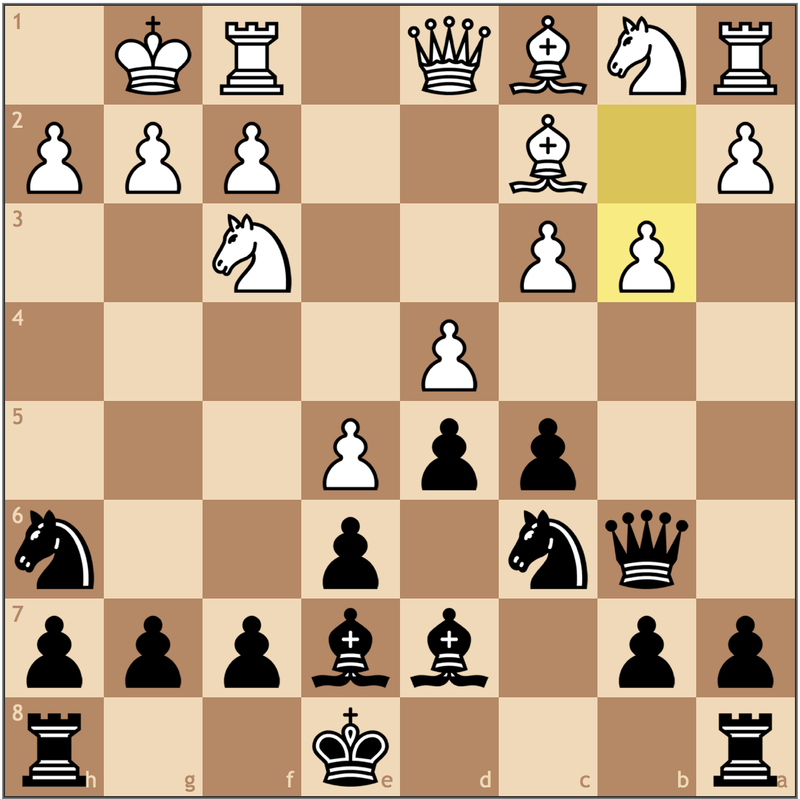 If Black allows this move, the e-file could open, thus allowing White active play and central control. If Black had opted for 12…d5, The game becomes challenging for White to make progress. If White takes on d5, the position quickly liquidates, for example, 12… d5 13. cxd5?! Nxd5 14. Bxg7 Kxg7 15. d4 N5f6 16. dxc5 Bxf3 17. Nxf3 Qxc5 = the pawns are symmetric and the only advantage White has is a bishop and knight combination instead of the knight pair. I feel like b7-b5 was only justified if Black had seen that 13… e6 keeps the position together. White is making progress, but now with this exchange, Black releases the tension in the center, giving White the e-file. One common theme that differentiates weaker players from experts is the fact that more experienced players prefer to keep the tension in pawn structures as trading pawns (like in this position) tends to weaken their position. 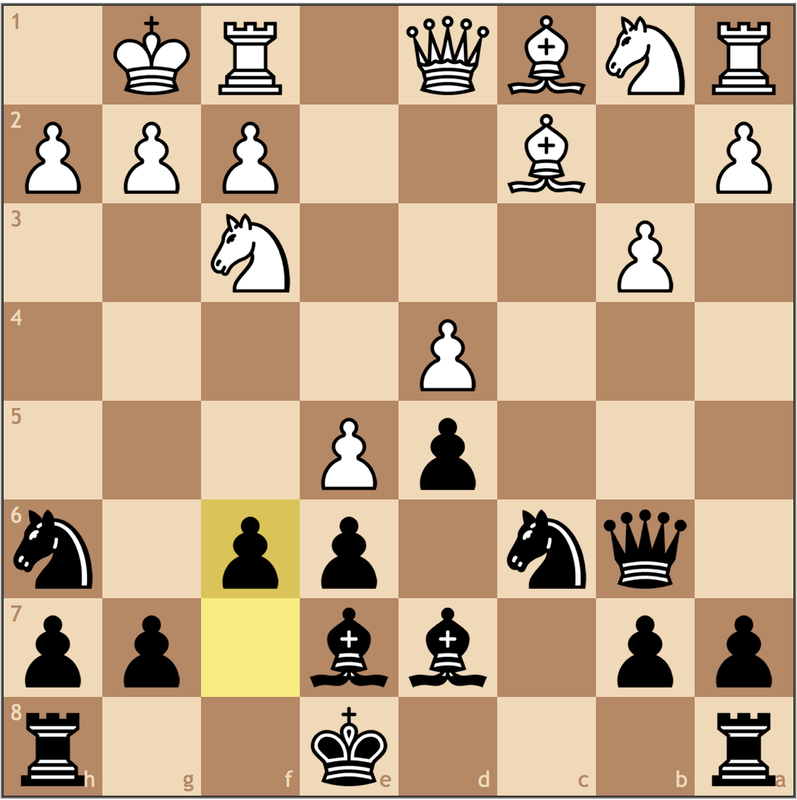 Here Black was reacting to d4-d5, shutting down the bishop, and therefore thought the trade on d4 was justified. 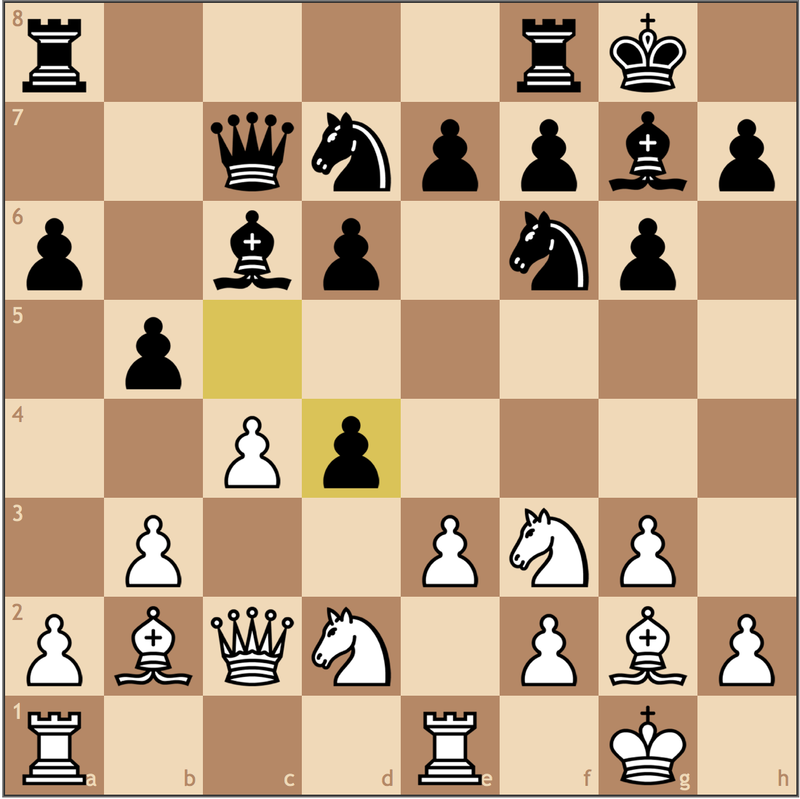 13… e6 would have sufficiently covered the d5 square, while not playing into White’s hand. 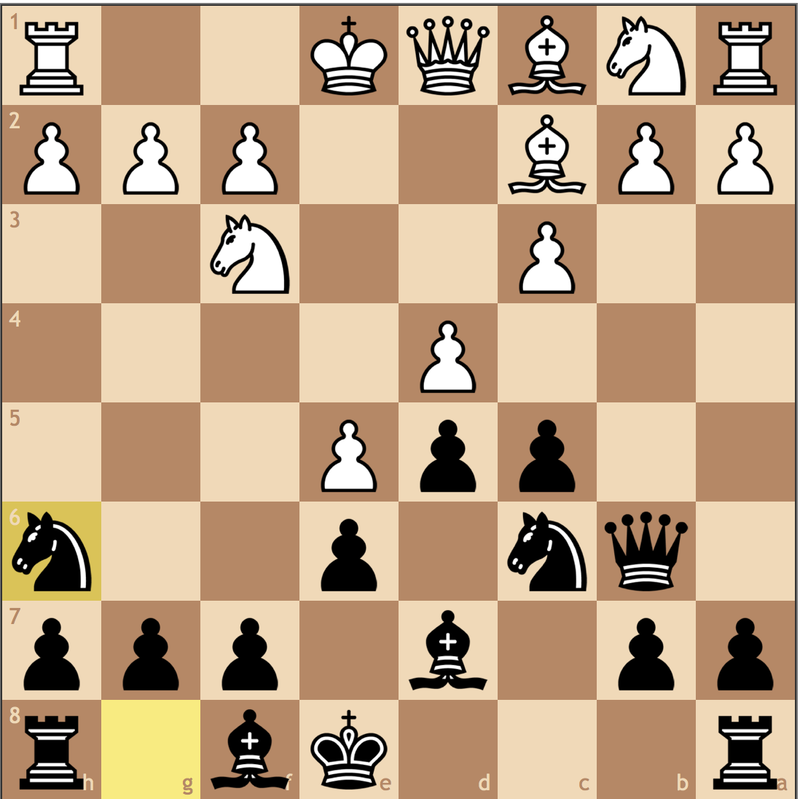 In that line, the rook on e1 seems misplaced and Black is still in the balance. A true pawn sacrifice! Now its the queen on c7 that is misplaced! 15…exd5 16.cxd5 Nxd5 17.Bxg7 Kxg7 18.Rac1 Rac8 19.Nd4 Ba8 20.Qb2! Excellent choice! 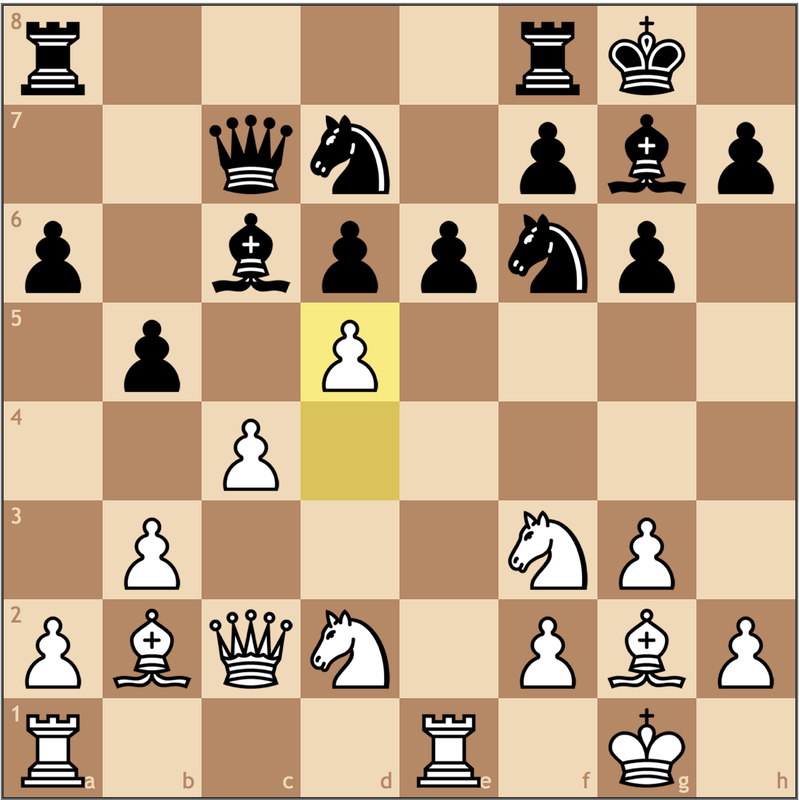 White threatens both the queen on c7 and a discovered check along the long diagonal. Black thought was out of the woods after …Ba8, but that is simply not the case! An interference idea! 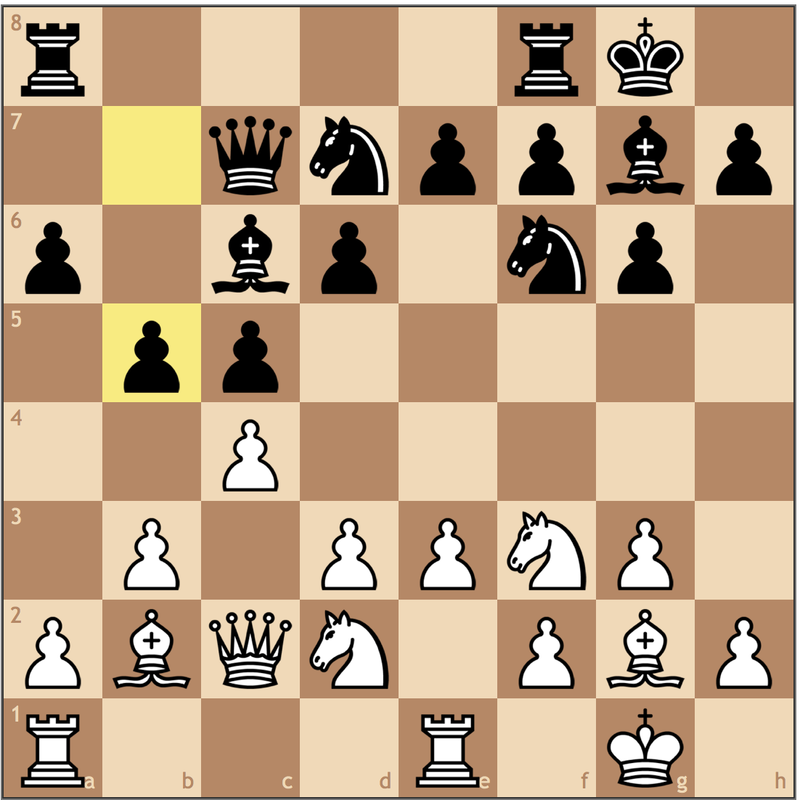 If White had just played Rxc3, …Qxd4 is annoying as the rook on c3 is attacked and pinned. 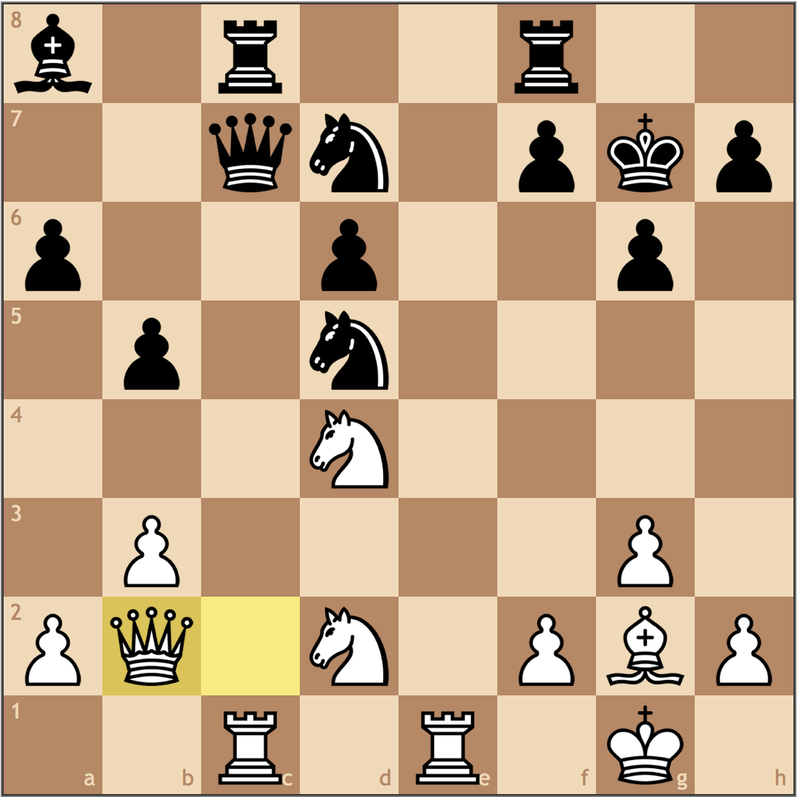 This move ensures that White will win material as the knight on c3 cannot be protected. Nice tactical vision! And now the game is completely over, White’s tactical acumen got him out of a passive opening, allowing him to assert his control over the game. A good game by Maciek, and my only real critique is the awkward opening development. Otherwise keep up the good work with the tactics. An unorthodox move justified tactically. 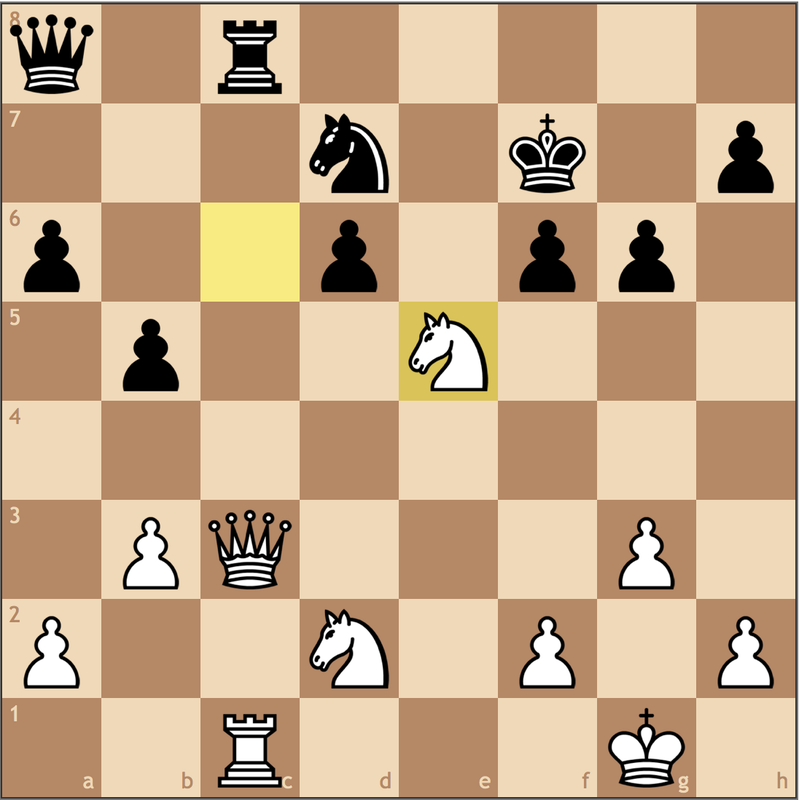 Should white take on h6, b2 is hanging, and with it the a1 rook. From h6, the knight will want to go to f5, where it can reach its fullest potential attacking d4. A move, which to me shows that White is out of his opening preparation, this move does not help White improve his position. If White played this move to take on h6, I think Black would be more than happy to accept as the trade would result in the opening of the g-file. Black hasn’t committed where he wants his king yet, so having doubled h-pawns gives Black the edge. White could have tried better with 9. dxc5, followed by the space grabbing b2-b4 push. With an imbalanced pawn structure, the game should yield promising play for both sides. A thematic break in such positions. Black hopes to weaken white’s central hold, and now the knight can choose f5 or f7, depending on what White chooses. Even without a castled king, Black has enough development to compensate. 11.Nc3 fxe5 12.dxe5 Nf7 13.Bf4 Rc8 14.Na4 Qc7 15.Re1 Ncxe5?? Some times, a threat is stronger than its execution. 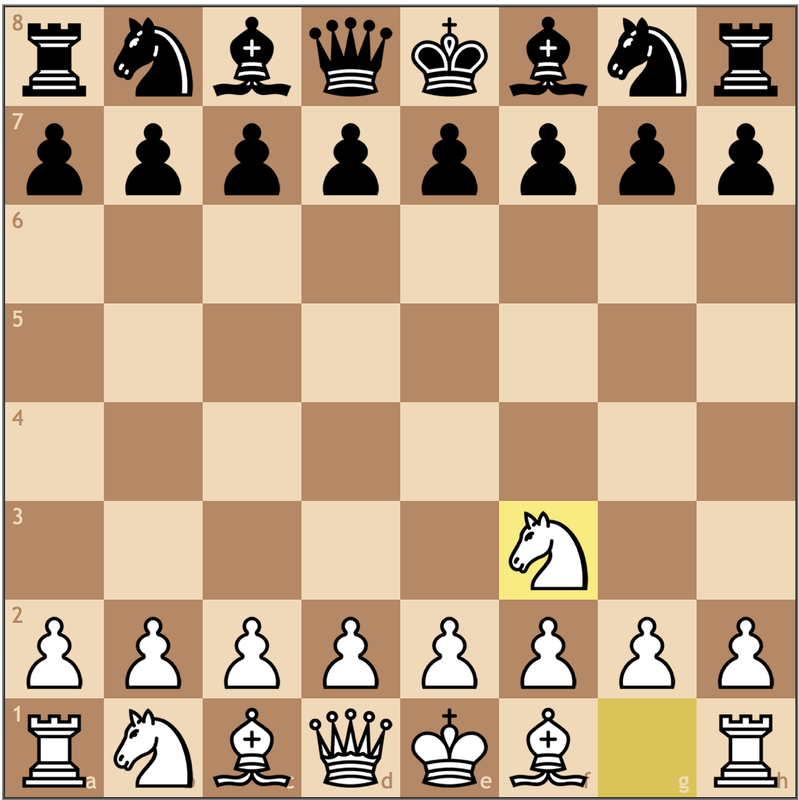 Here White’s pieces are passively defending the weak e5 pawn, but by capturing, White can trade off his weakest pieces at the cost of only a pawn. What Black needs to realize is that the e5 pawn will be weak forever since its blockaded by the e6 pawn, and right now blocks the e1 rook from doing any damage to the king. If Black really wanted to make the most out of his position, …b7-b5 would have been a nice way to grab space while also maintaining pressure on e5. 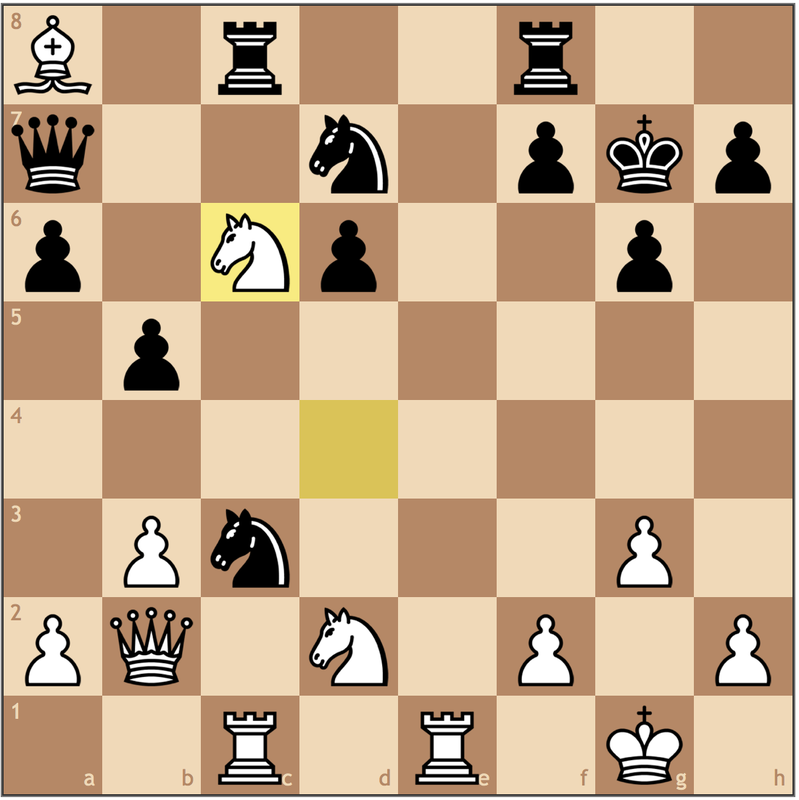 If White finds Rc1, he will have a much stronger position as Black is resigned to giving up the c-file. 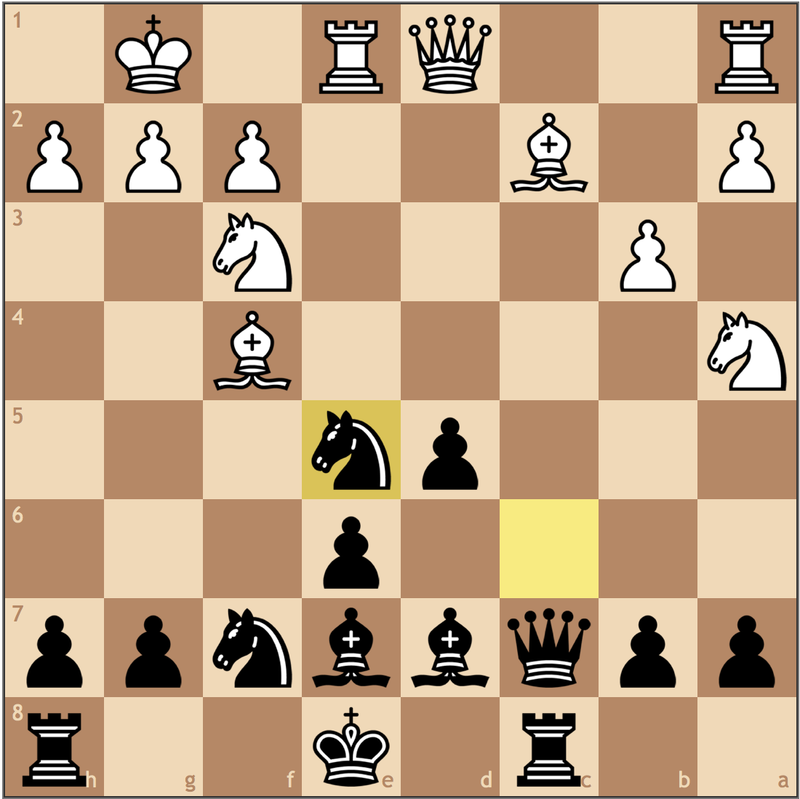 This move 17… Bd6 didn’t change things for Black by securing his only advantage. The computer likes 17… Qc2, going for trades, but such moves are to find over the board. Black gets lucky that White fails to find the right reputation. 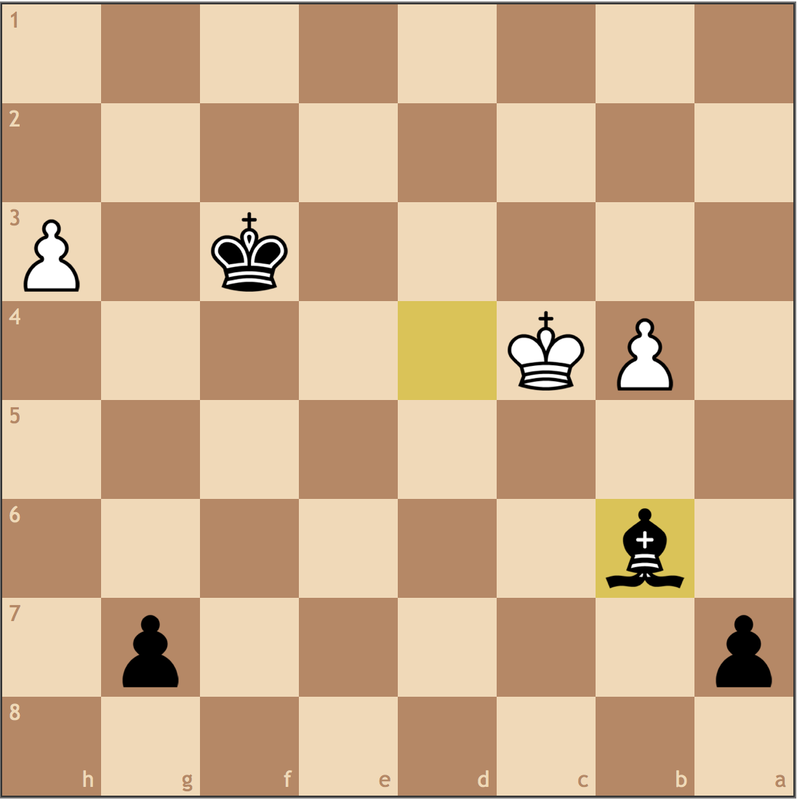 If Black was going to sacrifice a rook, why not also win it back with an extra pawn? Here 19… Bxf4 20. 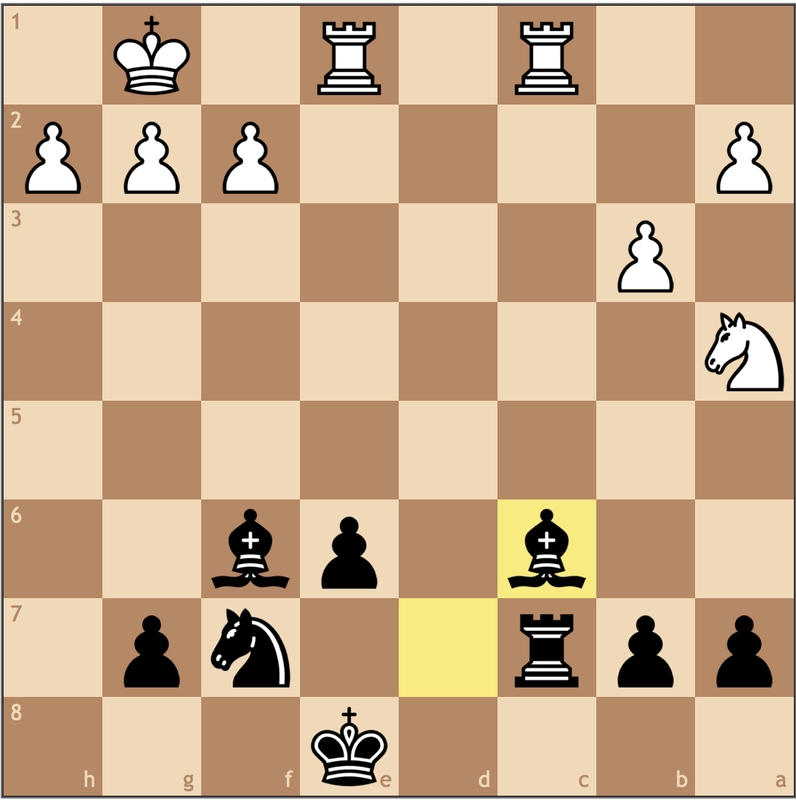 Nxh4 Bxh2+ gives Black a healthy advantage as 21. Kh1 Be5 is enough to put the game away. 20.Nxf4 Be5 21.Nxd5 Bxd4 22.Nxc7+ Rxc7 23.Rad1 Bf6 24.Rc1 Bc6? Giving up a pawn for free? I think Black was better before this moment as the pair of bishops is superior to the knight. I think a trade on c1 followed by ..Bc6 would have been adequate. 25.Rxe6+ Re7 26.Rxe7+ Kxe7 27.Nc3 Nd8 28.f3 Ne6 29.Kf2 Nf4 30.Rc2 Nd3+ 31.Kf1 Nb4 32.Rc1 Nd3 33.Rd1? In games that feel like a pendulum swinging, the guy to blunder last always loses. Here White must have missed that Bb5 at the end of the line is simply winning. Black should be able to easily convert the point. And White throws in the towel down a piece in a losing endgame. Interesting games to pull out two wins, but I think the second game provided the most concerning point with the early Ncxe5?. Generally, when you are better, you want to hold your advantage. If you have the initiative, but continue to make the game even more complicated, you can risk losing your advantage entirely. Once you are better, don’t be afraid to play simple chess and just improve your overall grip on the position. Pretty good games, and I’m hoping to see more!